As I have said before, I no longer remember where or when I first met fashion artist Nicolette Lang-Andersen. I do remember photographer Harry Leonard mentioning working with her and how talented she was. However, her star rose quickly and finding an open spot in her busy schedule became more and more difficult. Over the next few years, Lang-Andersen's resume quickly expanded - fashion stylist, personal stylist, writer, teacher and buyer. Then on June 15, 2016. she officially added fashion designer. 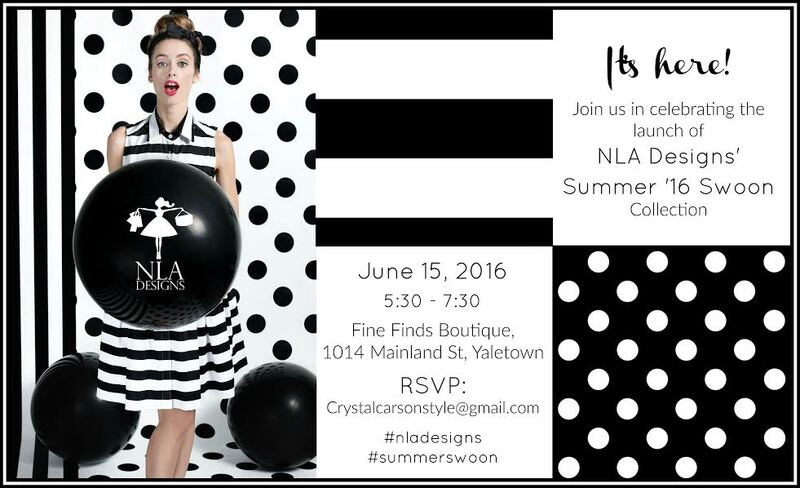 Under the label NLA Designs, Lang-Andersen launched her Summer ’16 “Swoon” Collection to an appreciative crowd at Fine Finds Boutique in Yaletown. This collection was a passion project long in the making and her excitement at seeing it finally become a reality was obvious. coffee with girlfriends, a day at the office or stepping out to a chic dinner." Those arriving at Fine Finds were first greeted by a classy white sports car decorated with large black dots. The black/white theme continued inside. A refreshment table offered black/white french macaroons, white jelly beans, black licorice in a few shapes, crispy cut cookies with artistic black/white frosting decoration (sponsored by Knead Consulting) and black foil wrapped chocolates. Nearby was a tray offering champagne - each flute outfitted with a black/white straw. Why the black/white theme? It mirrored the palette chosen for this season - a white, a black, a black/white print with large polka dots and a black/white print with large horizontal stripes. Stunning. Guests mixed, mingled, nibbled and of course headed to the dressing room to try on one of these great dresses. Numerous media outlets were represented including host Fiona Forbes of Shaw TV who filmed a live interview. Others include, Nicolle Hodges (CTV Host), Samantha Sito (Otisamantha), Colleen Tsoukalas (Clothesline Finds), Leeta Liepins (Our City Tonight), Zara Durrani (Inspired Life Production) Dominique Hanke (Blush Magazine), Natalie Langston (Canada Wide Media) and myself of course. The designer's long experience in the fashion industry also showed. Instead of coming up with a ton of separate pieces, Lang-Andersen offered a beautiful single dress with a unique concept. Women will love this. The dress is offered in sizes XS to X-Large and in a silhouette that looks fitted, yet adjusts gently and subtly to those small changes our bodies seem to go through from one day to the next. Brilliant! I know you're South African by birth. Can you share a little bit about how you ended up moving to Vancouver? What were the challenges? Landing in Vancouver was a bit of a fluke really and not a city that had ever even crossed my mind to visit let alone live in. In the last couple years of living in London, my husband and I started contemplating on where we wanted to settle down and start a family. We pondered on a few different places. but a dinner with friends of our one night set the ball rolling. Our friends had just spent a month in Vancouver and raved about what a wonderful city it was - balanced lifestyle, not crowded like London can tend to be, a big enough city (for my shopping habbit), great people and great sushi. Well, that was that and by the following Monday we had started out application and a year later we arrived with more bags than ten men could carry (all my clothes and shoes of course)! 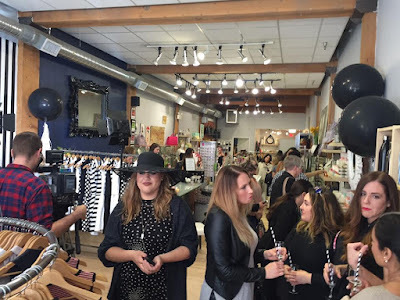 Also in the last two years of living in London, my personal styling business was taking great shape and I was definitely fearful that all my hard work and dream career could possibly come to a sudden halt when moving to Vancouver. I had heard numerous times that it wasn't a city known for it's fashion. But I thought - well, perfect - more work for me then! I researched as much as I could in the lead up to our move and joined many groups so that when I landed I had booked my first photo shoot the weekend we arrived. The following months I spent ferociously getting to know the city and the smaller retailers, walking in and introducing myself to anyone and everyone. For a year, I curated a great network of contacts who are now dear friends within the fashion industry and a year later I re-launched my personal styling business. How did your journey to embrace a career in fashion all come about? Like so many others in my position, fashion was never seen as a career option when I was growing up or thinking about what direction I wanted to go. I followed the path of the corporate field. This was my career for many years, but I always dabbled in fashion and sewing projects on a very small scale. It wasn't until work colleagues would ask for constant fashion advice that I realized I could make a career in Personal Styling. Your resume is quite varied. Can you tell readers about all the things you are involved in? Yup, I definitely have my fingers in a few different pies! And some are more on the forefront than others in this time of my life. For example, my writing has been on a bit of a back burner for the last year and a half, as has my personal styling - mostly because I have a 1.5 year old and I had to let a few things go in order to maintain some sort of balance. Being approached to buy for Fine Finds boutique and teaching positions at VCC and JCI have been a wonderful new experience that I didn't foresee in my fashion career, but roles I feel very comfortable and passionate about. My latest endeavor into designing has been all consuming over the last 6 months and out of all of my roles, it has been the most challenging but rewarding in the same breath. Recently you launched your first collection. This is a passion project you've been working on for awhile. What was the driving force that led you to this moment. The idea to create a single item that works for most (not all) body shapes hatched about 2 years ago after working with my female clients. Most of them brought up the same frustrations of not being able to find pieces that work for their shape among all the trend specific items on offer. Another challenge was the difference in sizes that were offered from one store to the next, which is where the NLA DESIGNS dress offers a solution. Each size accommodates for 2 sizes - for example, a size S works for a size 4-6 perfect for weight fluctuations or those with in-between sizes. Coincidentally, this was when I fell pregnant and although the prototype was complete, I decided to put it all on hold during my maternity leave and get acquainted with my little man. I picked up the project again November last year and it's been a whirlwind ever since. Please share your inspiration for Swoon 2016. Who is this collection designed for? This dress is designed for women from all walks of life - corporate, stay-at home moms, teens. The dress' classic style and design make it appropriate for many ages and for different situations, from office to evening, daytime frolicking to a day at the races. The dress is a crisp and timeless style enlivened by the use of two fresh prints (stripes and polka dots) and two versatile solids (black and white). The limited palette and bold prints allow the wearer to dress in comfort and accessorize with flare and imagination to create a personal statement what will ooze confidence. Is this a line you will be adding to with each upcoming season? I plan to, yes. The dress will always be the main focus and be a constant, but I'm already thinking about adding in a few pieces. What advice can you give young people just entering the world of fashion? Research! Research your product, your city, your client. Stay focused and remember why you started out doing what you are doing. Keep a group of positive and uplifting people around you on your journey and don't take to heart any negativity, they are just little hurdles. Always follow your gut instinct. Please share a favourite fashion quote.